EAT SHOP STAY Treat yourself to the famous Shack Attack Burger at Betsy's Burger Shack and stop by the Old Fashioned Bread Bakery & Deli for a selection of delicious, traditional Ukrainian baked goods. Smoky Lake Inn For the highest quality pork, chicken, lamb, eggs, vegetables, and honey visit Serben Farms at their farm store to find all these, along with high quality local beef, artisan cheeses, soups, pickles, jams, Ukrainian foods and much more! (See ad page 10). Enjoy a meal at Smoky Lake Inn – where you'll also find the largest wine selection in northeastern Alberta! – and stay the night where history and luxury converge. Also, check out the new Super 8 along the highway for your stay in Smoky Lake and the new Gofer Liquor featuring a growler bar with 12 items on tap! 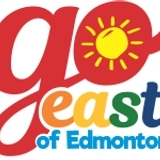 @GoEastofEdmonton Thank you for this informative and unique site [@GoEastofEdmonton]. I like it because you uncover the hidden awesome events that have that small community love and feel!!! from Facebook Fan Keryl. 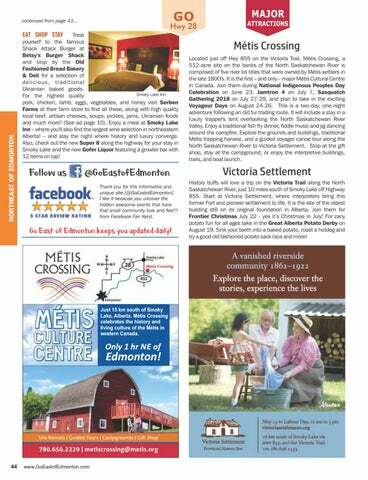 Go East of Edmonton keeps you updated daily! Just 15 km south of Smoky Lake, Alberta. Métis Crossing celebrates the history and living culture of the Métis in western Canada. Métis Crossing Located just off Hwy 855 on the Victoria Trail, Métis Crossing, a 512-acre site on the banks of the North Saskatchewan River is comprised of five river lot titles that were owned by Métis settlers in the late 1800's. It is the first – and only – major Métis Cultural Centre in Canada. Join them during National Indigenous Peoples Day Celebration on June 23, Jamtron 4 on July 7, Sasquatch Gathering 2018 on July 27-29, and plan to take in the exciting Voyageur Days on August 24-26. This is a two-day, one-night adventure following an old fur trading route. It will include a stay in a luxury trapper's tent overlooking the North Saskatchewan River Valley. Enjoy a traditional fish fry dinner, fiddle music and jig dancing around the campfire. Explore the grounds and buildings, traditional Métis trapping harvest, and a guided voyager canoe tour along the North Saskatchewan River to Victoria Settlement. Stop at the gift shop, stay at the campground, or enjoy the interpretive buildings, trails, and boat launch. Victoria Settlement History buffs will love a trip on the Victoria Trail along the North Saskatchewan River, just 10 miles south of Smoky Lake off Highway 855. Start at Victoria Settlement, where interpreters bring this former Fort and pioneer settlement to life. It is the site of the oldest building still on its original foundation in Alberta. Join them for Frontier Christmas July 22 - yes it’s Christmas in July! For zany potato fun for all ages take in the Great Alberta Potato Derby on August 19. Sink your teeth into a baked potato, roast a hotdog and try a good old fashioned potato sack race and more!